Ailing supermarket chain Kwik Save has announced it is to close more than a third of its stores immediately as it battles to secure its future. After the closure of 79 stores, to be completed by Wednesday, 147 outlets will remain open. Usdaw, the union representing shop workers, said that "hundreds" of jobs would be lost by the move. Last week, Arla Foods stopped delivering milk to the struggling chain because of "payment problems". At its Wellington, Shropshire store, customers turned up to find a note at the shop, announcing its closure. The most recent figures from research group TNS, for the 12 weeks to 22 April, showed Kwik Save's share of supermarket spending had shrunk from 1.2% in 2006 to just 0.2% a year later. Kwik Save said that workers had been given "much longer" notice of the closures than just a day but did not specify further. It was "with regret" that it had made "this difficult decision", it said in a statement. "However, in order to enable the business to succeed, the Kwik Save management team has had to announce these cutbacks to secure the future of the business," the firm added. "Kwik Save would like to thank all of its staff affected by this regrettable situation for their commitment to the company over the years." An Usdaw spokesman said the union would be seeking an "urgent meeting with the company to clarify what redundancy package workers can expect, as well as discussing the long-term future of the business". Last year, the owners of Somerfield sold off the loss-making Kwik Save brand and most of its stores to BTTF and rebranded about 100 Kwik Save sites that it kept. In February this year the chain received a £50 million rescue package. 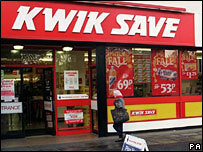 Retail expert Theresa Whickham told the BBC that Kwik Save had not been keeping up as big retailers moved into the convenience shopping market. Other analysts have said that the chain has struggled against low-cost rivals such as Aldi and Lidl.